Like magic? Like cocktails? 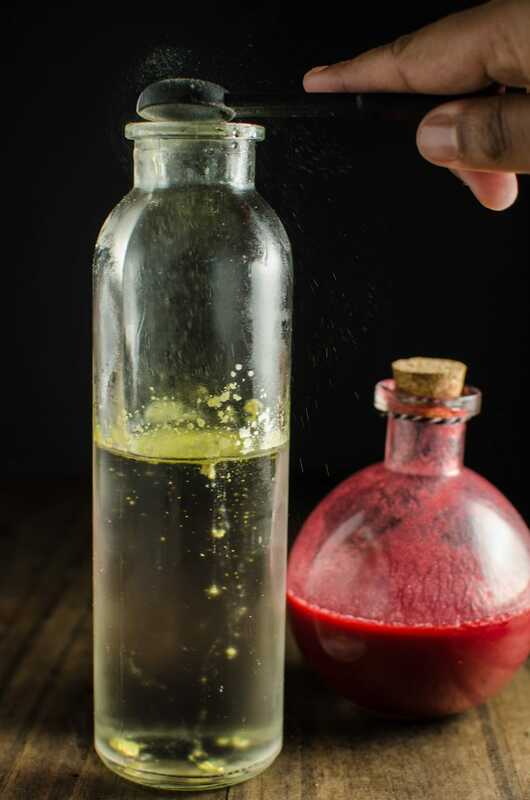 Then you’re going to LOVE this VIDEO and Instructions to Make your own magic potion shimmery liqueur in ANY colour you want, with this neat little trick! 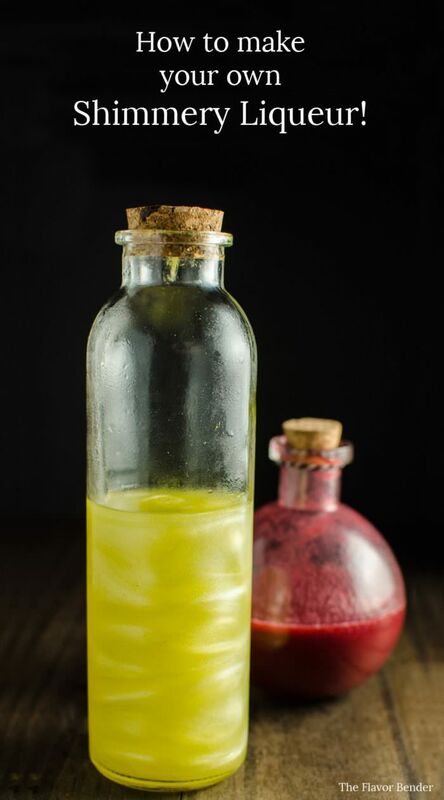 Learn How to make Homemade Shimmery Liqueur (Homemade Viniq)! Today I’m sharing with you guys a super cool discovery that I made recently! Have you heard of VINIQ before? According to their website, Viniq is a “delicious combination of Premium Vodka, Moscato, Natural Fruit Flavors, and a one-of-a-kind shimmer”! It truly is one of a kind. So much so that it has got to be the most mesmerizing liqueur on the planet right now. All because of that colour and that incredible shimmer! Go on and check it out right here. See what I mean? FIND OUT HOW TO MAKE FRUIT INFUSED FLAVORED SHIMMERY LIQUEUR HERE! But what if you don’t have access to Viniq? What if you too could have shimmery liqueur regardless? What if you could replicate that shimmer at home? All you need is one special ingredient – Luster Petal Dust! 🙂 Don’t worry, this is very easy to find in your local cake store or online. I found mine in a local cake equipment and decorating supplies store, but I have also bought some previously from Amazon. And the best thing about this is that you can make shimmery cocktails in pretty much any colour you want! Viniq is apparently the world’s first shimmery liqueur. But now, for the VERY FIRST TIME – you can make your own homemade Viniq too! How can I change the colors of the Shimmery liqueur? You can change the colors of the homemade viniq, simply by changing the color of the luster petal dust. Here are some suggestions for colours. Pearl petal dust – This dust is pearly and opaque and leaves ONLY the shimmery swirls and no color! It’s perfect if you don’t want to add any color and only want the shimmery swirls. Note – when you mix two bright colours, you will get beautiful shimmery swirls at first, but eventually the two colours will mix to give you something more dull. For example, when I mix yellow and purple together for a cocktail, I get a beautiful blend of the two at first. But after a little while, it turns into a dull dark yellow. Not good. You do still get the shimmer though. You don’t have to worry about any colour change with just one colour though. It’ll stay beautiful and shimmery throughout (once you shake it!). Making the shimmery liqueur is easy. All you need is your favourite flavoured vodka, a simple syrup and petal dust in your favourite colour. 🙂 I used peach flavoured vodka in this recipe, but you can use any flavour you like. Or combine a few to get a more intense, fruitier liqueur. To make classic Viniq, just mix a fruity, sweet wine, with vodka and luster petal dust. If you want you can add some extra simple syrup to make it sweeter. How can I make flavored homemade shimmery liqueur? Just follow the recipe here to make fruit infused shimmery liqueur! Did you know you can make COLOR CHANGING SHIMMERY LIQUEUR too? 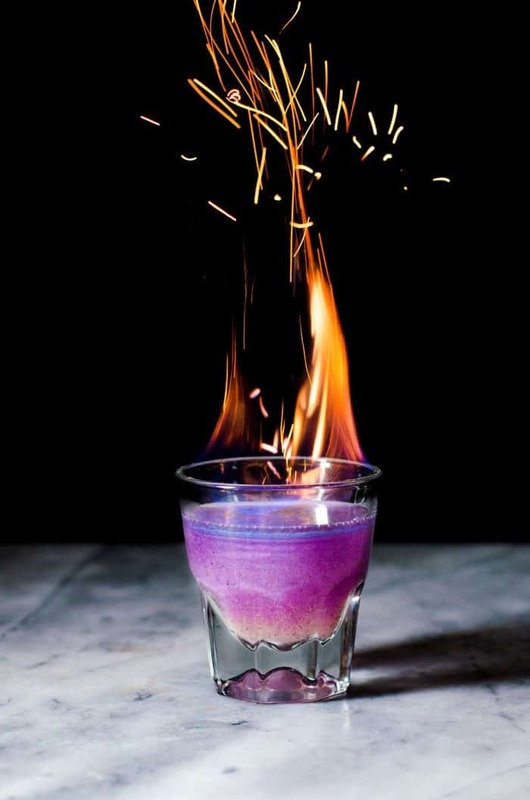 Thanks to butterfly pea flowers, you can make color changing alcohol or liqueur too! Just infuse the vodka (or gin or tequila) with butterfly pea flowers and proceed to make the liqueur by adding some simple syrup! You can make cocktails like this The Phoenix Cocktail! I have tried this luster petal dust trick with a few other liquids to see if I can replicate the same effect that I see with alcohol. I used it with water, apple juice, oil and golden syrup. From what I have noticed, the viscosity and density of the solution seem to be the main reasons for this shimmering effect. Liquids with high viscosity and less density than water like alcohol and oil (not that you’re ever going to drink oil, but I just wanted to test my hypothesis) work really well because those two properties enable the kind of light refraction you need, to see that beautiful shimmery effect. And the moment I add water to dilute these two solutions, I can see how it sort of breaks up the shimmers because it changes the viscosity/density. On the other hand, golden syrup (which is more dense and more viscous than water) gave me an intermediate effect. So to sum up, while all the liquids I tested produced some shimmery effect, alcohol produced the most desirable shimmers. You can only imagine how much fun I had with this! I mean think of all the applications? 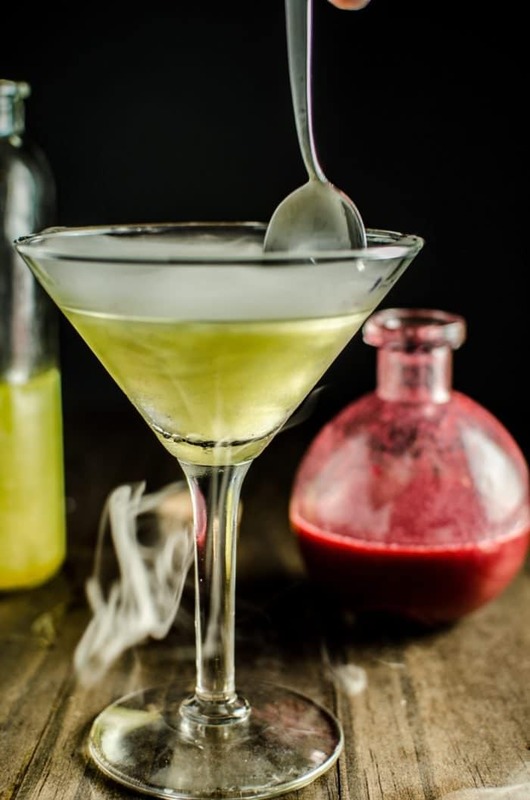 You can turn your martini or margarita or any clear drink into a legit magic potion! Like I did with this cocktail earlier this week, which I call The Witch’s Heart! 🙂 A Halloween favorite on the blog! Or make this Unicorn blood cocktail (A Peach and Raspberry Cocktail)! It’s red, it’s gold and it sparkles. Blame it on the spirit of Halloween baby! 🙂 So go on, get that recipe now. 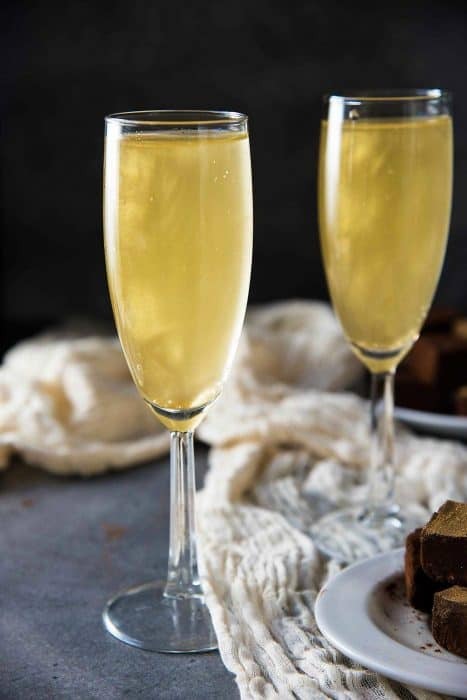 Or this simple and easy Gold Shimmery Champagne Cocktail that’s PERFECT for special occasion or as a New Years Cocktail! Now that you know how to make shimmery liqueur, what would you do first? If you liked this homemade Viniq recipe, don’t forget to subscribe for new (and free) recipes and updates by entering your email address below (and get all these recipes delivered straight to your inbox), so you don’t miss out on a thing. You can find me on FACEBOOK, TWITTER, INSTAGRAM, PINTEREST too. Learn how to make shimmery liqueur (like Viniq) in any colour you want, with just one magical ingredient! Mix the vodka and simple syrup until well combined. Stir in the petal luster dust. Swirl the liqueur just before use, as the luster dust will settle to the bottom after a while. Try not to use too much shimmery luster dust. Some luster dust is marked as edible, and some are marked as non toxic. I try not use more than 1/4 tsp per cup of liqueuror spirit (vodka, tequila or gin). Just enough to give it a shimmer and light swirls. If needed I might add just a pinch more to a drink after I've made it. 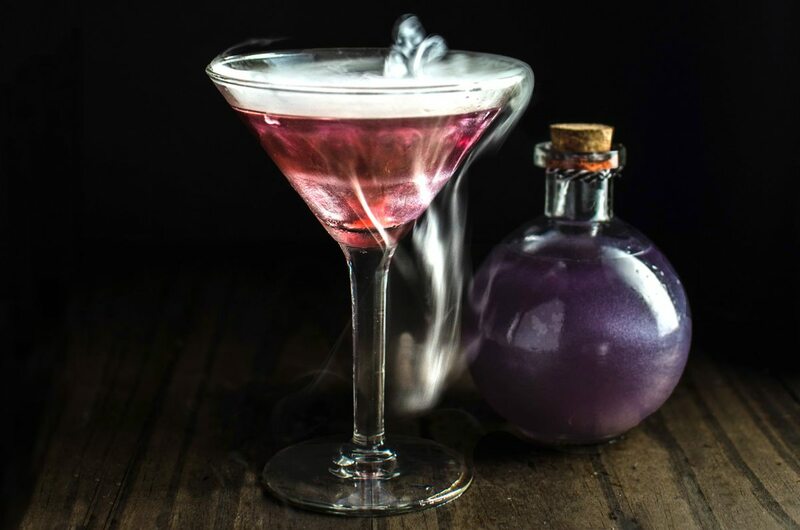 Adding a teaspoon or more of the luster dust PER DRINK is not advised, so only add just enough to create swirls in a CLEAR cocktail (which will show the best results). Will this Luster Petal Dust and alcohol work in a punch fountain?? I’m thinking the shimmers will be continually mixed, hence not on the bottom. What do you think? I haven’t tried drinks in a punch fountain before so I cannot be absolutely certain. However, the luster petal dust can work in any alcoholic drink, but the shimmery swirls will only show up if the drink is clear and not cloudy. 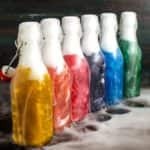 I have been producing and selling luster dusts for 16 years. Luster Dust and Petal dust are two distinct products used in the cake decorating industry. There is no such thing as Luster Petal Dust. Be sure you purchase only luster or super pearl, or pearl dust. Petal dust has a flat finish and will NOT give you the effects you are seeking. Neat idea. Would you be able to provide a specific Amazon listing? I’ve searched on eBay and Amazon and find a lot of non-toxic luster dust but I don’t know if it is the right thing? https://www.ebay.com/itm/Petal-Dust-GUMPASTE-FLOWER-DUSTING-POWDER-Cake-Decoration-Luster-Sparkle-Pearl-D/150944889571?hash=item2325043ae3:m:mm-2VPTAwoYSZm8Mj5ZnOQw <– this says luster in the description but says it's really for "dry" things.. I saw your post but it really just searches "edible luster dust" on Amazon. Through that, I did find: https://www.amazon.com/Food-Grade-Luster-Dust-Grams-Flamingo/dp/B00594DDGA/ref=pd_sbs_325_6?_encoding=UTF8&pd_rd_i=B00594DDGA&pd_rd_r=YC0N551DMR0M4BW47JKQ&pd_rd_w=Ws3Hd&pd_rd_wg=elB3Y&psc=1&refRID=YC0N551DMR0M4BW47JKQ <– but at $11.50 for one color, that feels very pricey. Thank you for the reply and assistance. Hi JD! I do like sugar flair products and trust them! I would go with it, eventhough I haven’t used their luster petal dust before. Unfortunately, buying luster dust is a little pricey online. I bought mine in a baking suplies store, so they weren’t as expensive as buying online. I will try to locate an online retailer that sells the brand I currently own and update the post! Hi JD, not sure if you’re still interested but instead of buying your luster dust online you can buy it from craft stores like Michaels or Hobby lobby and it’s much cheaper 2 gm is $4.49 plus you get 40% off coupon which brings it to $2.50 . Hope that helps. You can usually always buy them on sale. Correction: Even though they may say they are for decorating cakes, they may not be edible . Some are truly for enhancement of the design of the cake, for decoration purposes, and are not meant for ingestion. Be Careful!!! Hi Mazzy! Thank you for noting that! 🙂 I have mentioned in the post that it is important to find food grade edible luster dust. And since you ONLY should use no more than 1/4 tsp for 1 1/2 cups of liqueur, which will be diluted in other drinks before being enjoyed (Plus we won’t be consuming the whole bottle in one go either). 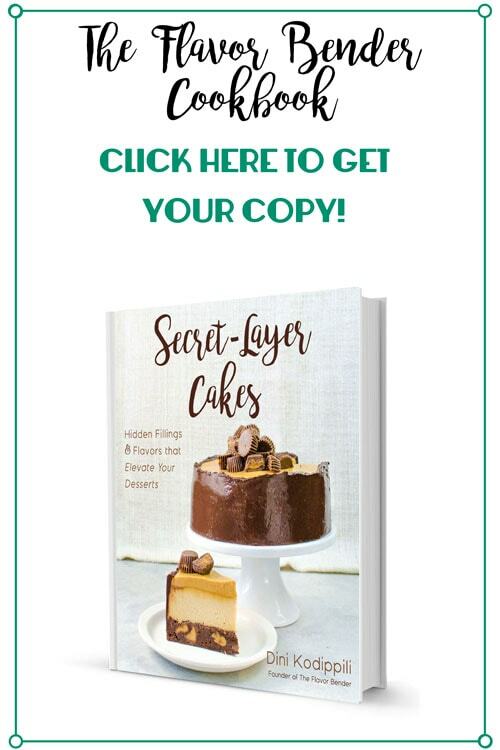 Thankfully for these reasons, you will be ingesting only a small amount of the luster dust, just as you would if you enjoyed consuming a luster dust decorated gum paste or fondant decoration on a cake! So, since the effect changes with the viscosity of the liquid, I’m assuming that the way I make my drinks- vodka, club soda, and lime or lemon juice or some other lo-cal flavor (I’m diabetic) and no sweetener – wouldn’t work worth a damn. Drat. I did so want to have shimmery drinks! Also, I assume for the photos you put some dry ice in the drinks? I am now going to be following you! It won’t have quite the same effect, but it will still be very glittery in the sun! It will still have shimmery swirls every time you stir the drink too, but it will also settle to the bottom much faster. 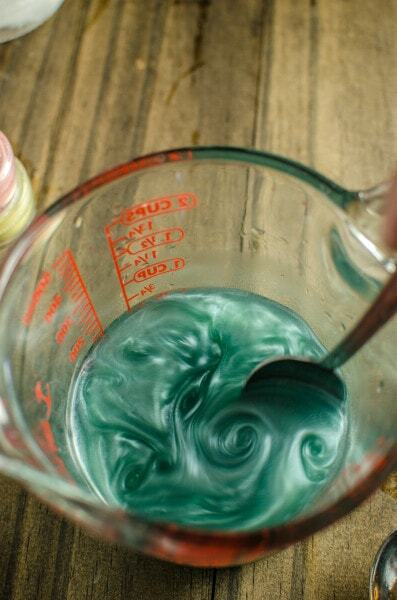 And yes, I did add dry ice – only because it helped create the swirls while I was free to take photos! 🙂 It’s not an important ingredient in any way though – just for the added effects. 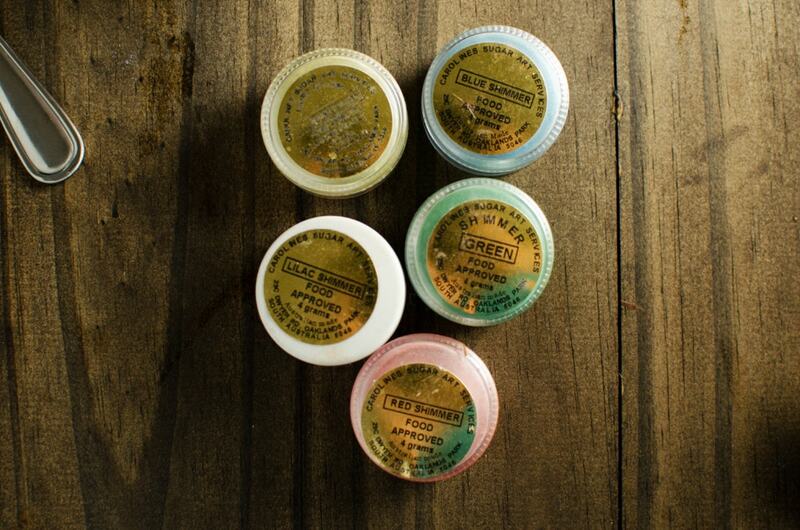 Have you tried a color of luster dust like blue pearl or natural pearl from the Chef Alan collection? I’m curious how it behaves with colored liquors. I haven’t tried the pearl dust collection from Chef Alan unfortunately! I did look it up, and it looks quite similar to what I am using right now. The current white pearl dust I use is from Sunflower sugarcraft, and I love it! As a general rule of thumb, I only use a similar color of luster dust for a colored liqueur, OR the white luster dust. 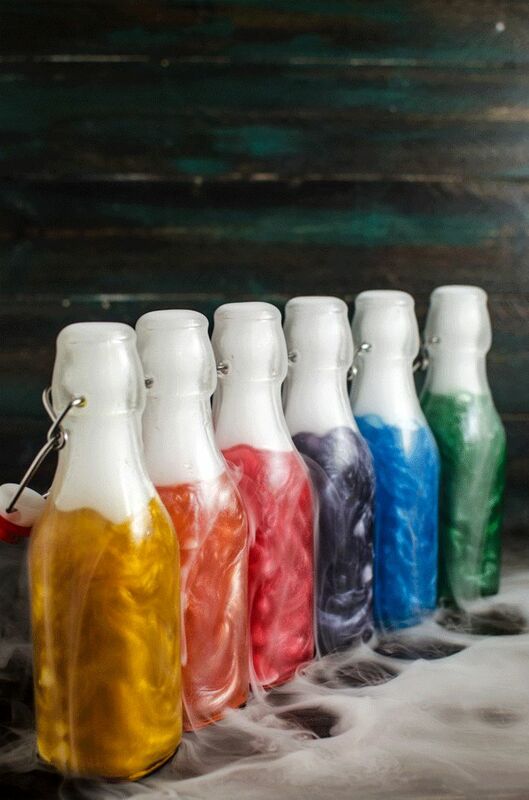 Combining different luster dust colors with colored liqueurs should be ok, but just like mixing paint colors, the result is a mixed color liqueur. I hope that helps! I do often mix pearl luster dust together to get different colors, and I’m fairly certain that if you add yellow pearl dust to pink vodka, it will result in an orange-ish colored vodka 🙂 If you mix too many colors together, they will end up a murky brown color though. This is awesome! Thanks! I just wanted to mention something about color mixing – if you mix complimentary colors, the result will always be some drab shade of blah. Otherwise, I would think mixing other combos would work ok (like blue and green or green and yellow…). Can’t wait to experiment with this! I’m not expecting a quick reply but it would be great, I bought myself some royal purple petal dust to try this out. now the package said that its non-edible. although it also said that it’s non-toxic. is it safe to use? Thanks for this. Can I ask if I can create a similar glittery effect to drinks such as sodas and cold brew coffee? Thanks much for your info! I’m sorry for the late reply! Thanks for getting back! I really enjoy your posts. Anyway, I’ve tested it using cold pressed juices that I’ve made with my own slow juicer at home. However, I was recommended by a pastry shop owner (who sells luster dust and disco dust) that disco dust might work better because luster dust is more for beverages with alcoholic content only. So I bought the CK luster dust (hologram silver) and poured a bit (4 spatulas) into a 250ml bottle. The results? Not as what I could expected. It’s just that when you shake it, you can see silver specks in the bottle. Well, looks decent but it’s not that great. Still got see it glitter a little though. Hi Jason! Thank you so much 🙂 I’m really glad that you enjoy my posts! I honestly wouldn’t have recommended disco dust because it’s too heavy for any kind of liquid and will sink faster. I’ve tried it and it doesn’t have the same effect. It’s because the luster dust is so fine and light, that it works to “shimmer”. Viscosity makes it shimmer more, and the density suspends the dust. It also helps to have a translucent liquid (colored or clear). The more cloudy the liquid, the less the shine will show. The post will be on the blog in a few weeks… I will let you know when it is on the blog! Thanks for this information. It’s really helpful. Just to clarify: Xanthan gum, as you mentioned, is one of the “ingredients” / “substance” contained in lustre dust? I’m so excited to try this! This may be a silly question but what is a simple syrup? Not sure what to buy! Thanks! Simple syrup is Sugar and water mixed in a 2:1 ratio and heated until the sugar has dissolved and is slightly syruppy 🙂 You don’t have to buy it at all, and it’s really simple to make at home! I’ve JUST added a post to make Flavor infused shimmery liqueur now too (with a video). you can check it out now too Melanie! Hawaiian ice flavors might work nice then? I’m loving this idea and ready to try it for a RuPaul Drag Race viewing party next week (when gathering girlfriends to watch the drag queen Olympics, one must make swirly sparkly cocktails). Question: is the simple syrup required for the viscosity of the drink or is it simply for taste? We’re kind of a low-sugar, high-vodka kind of moms group and I would like flavored vodkas would already be sweet enough. Thank you so much for your advice re: simple syrup! I am absolutely LOVING your viewing party idea! The simple syrup is definitely not required, it’s simply for the taste. I keep infused vodka without syrup in my cupboard which I often use for cocktails. However, I do recommend that you use a good quality vodka so that it’ll taste great straight up as well (I use a vodka that I know I like to drink). Alternatively, you can have some syrup on hand just in case you need a little sweetness. Thank you and you’re welcome to join us in Seattle Thursday night! This is beyond cool!!!!! I am getting online now to find me some luster petal dust!!!! Oh my goodness, absolutely brilliant! I can’t wait to make some myself. I was unable to find the Luster petal dust. I could, however, find Wilton Pearl Dust, in Gold. Do you think it would have a similar effect? Would love to know how it turns out! How fun is this! Great post, and I’m going to be keeping this in mind! Mind. Blown. Oh my god. You are a genius and the best person ever. These are so incredibly beautiful and I can’t get over how cool this is. I happen to have gold and red dust at home so I am going to have to try this asap. Seriously. i could kiss you, this is so cool. Dini, you are turning into quite the food chemist! I’ve never seen or heard of anything like this before – I love it and pinning! How fascinating. I had never heard of luster petal dust, but now I’m so tempted to buy some to play around with. That shimmer is so enchanting. Is the alcohol essential for this? (I love a good cocktail, and it’s fine if it is…) Just wondering if this would work with other liquids. That is sooo cool Dini! I can just imagine you wearing a white lab coat instead of a kitchen apron when you are testing your recipes. What a fun idea for the holidays! Oooh, how pretty!! You are seriously amazing girl! This is genius!! Thank you Naina!! 🙂 I still swirl the bottle to look at the shimmer at home! hahaha!! This is so cool, Dini! My son bar-tended his way through college, and still loves to play at making us cocktails. I’m going to make sure he sees it! How very cool to find that then recreate it yourself – perfect timing before Halloween too! Would be so impressive at a party. Thank you Caroline! It would be perfect for a halloween party 🙂 I’ve still got a few colours in the fridge that i’m saving up for Christmas! I am in awe of your mad scientist skills! Hehehe. This is seriously awesome, Dini! I cannot wait to try it! I love seeing what you are going to come up with next! Pinned and I’m sharing it on my Facebook page in a few minutes! Sending some other foodie love your way too! Awesome! I have some black vodka that I want to use to make a drink and this would be great! I think I have some in my cake supply box!! Thank you for ththis unique idea Dini.